Stepping on to the 1st tee at the Newcastle Golf Club is a step back in time to the grand days of golf course design, where the lie of the land and old fashion shot values largely determined the routing of golf courses. Incorporated in 1906, the Newcastle Golf Club’s first course on the present site was established as a 9 hole layout on sandy dune country, close to the ocean on the ‘remote’ northern outskirts of Newcastle at Ferny Bay. Back in those times, access to Ferny Bay from the township of Newcastle was by ferry and it was not until the 1930s that cars could be taken across the bay allowing easier access to the course. Prolific Australian amateur turned course designer, Eric Apperly, was commissioned to complete a full 18 holes in 1936 and the resulting layout is somewhat of a classic, incorporating a number of holes from the 1906 layout which are still in play largely untouched to this day. The golf course is repeatedly ranked in the upper echelons of golf courses in Australia and has laid claim to being Australia’s best regional course outside of the major capital cities. Only the recent opening of the two courses at Barnbougle Dunes in Tasmania and ultra private Ellerston, in the nearby Hunter Valley wine region, have threatened that mantle of late. In the days before machine powered earth moving equipment, course designers opted to use the lay of the land as opposed to the highly laborious process of moving earth and trees to create golf holes. Apperly’s work at Newcastle is no exception, with holes brilliantly routed over and between natural dunes and undulations. Playing this golf course, indeed simply walking in the fantastic natural surrounds, is a rare pleasure. The golf course includes many aspects in its design that modern architects eschew, blind tee shots abound, bunkers not in sight from tees, a distinct lack of water hazards, a superb mix of short and long par 3s and all of the par 5s measuring under 500m in length. In fact, there are not too many courses that feature three of the four par 5s that dogleg significantly from left to right, with the remainder a straight away hole. This rare feature had me looking through the records to see whether Apperly was a left hander (he wasn’t!) or perhaps played with a strong fade. The conclusion I’ve drawn, based on the layout and some of his writings on course design philosophy, support the fact that Apperly designed the course purely on what he saw was possible given the terrain and without strong regard for the value of ‘par’ comparable to the length on any particular hole. The course is littered with subtle challenges that lull you into a false sense of security. Many short irons are played from hanging lies above and below your feet and the lines of sight to some greens are obscured by the natural dunes that cross the fairways. 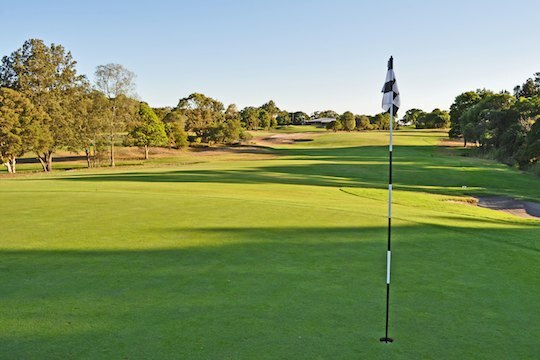 The stretch of holes from numbers 5 through 7 are regarded as Newcastle’s best, with the par four 5th and 6th holes often ranked amongst not only Australia’s but some of the world’s finest. The short par 3 seventh is a gem of a hole where the premium is on hitting the narrow green, with marvellous deep bunkers protecting the front and forcing you to take enough club to risk bringing the steep drop off over the back into play. It is a hole that would not be out of place on any of the sandbelt courses of Melbourne and has been rated amongst the best 18 holes in the world outside of the US and Great Britain. The finish to the golf course from the 14th onwards is particularly strong, even with today’s modern equipment. This stretch of holes can definitely be a card wrecker today and must have been extremely punishing 80 years ago. The golf club have commissioned course designer Ross Watson to devise a plan to work on certain aspects of the course over the next decade or two. Thankfully, the policy of the club is to only make changes to the course in the future based on what’s in the plan and retaining the essence of the original design. According to the club’s General Manager, Paul Foulcher, this will be achieved by clearing some of the foliage that has grown in to affect the lines of play on some holes, moving a few tee locations slightly to avoid neighbouring holes and bordering roads that modern equipment have now brought into play and to upgrade some of the bunkering over time. Mr Foulcher pointed out Apperly’s affection for the design work of Dr Alister Mackenzie, who’s trip to Australia in the 1920s resulted in his blueprint being stamped on many of Australia’s finest courses, including Royal Melbourne and the NSW Golf Club, the latter of which Apperly also had a large role in designing. Unfortunately, Apperly passed away before all of his intended bunkering in the ‘Mackenzie’ style was completed at Newcastle. The club plans to honour his original plans by upgrading some bunkers, whilst also replacing some of the bunkering that had been subsequently added over the years by well meaning committees. More sandy waste areas that better suit the natural terrain and allow for less maintenance will be part of the changes in the future. To this end, the club has also altered it’s watering system recently so that only fairway areas are irrigated, leaving the rough areas to return to their natural sandy waste appearance and playability. This change has had an almost immediate impact, according to Mr Foulcher. Contrary to what might be expected of a course of this stature, Newcastle is open to the public on selected days of the week and is a must for any serious golf aficionados. In fact, its close proximity to Newcastle’s Williamstown airport and with motel accommodation on site makes it a far more accessible venture these days than the early enthusiasts had to endure with their ferry ride over 100 years ago.